Our in-house training is 100% focused on your business. In-house training ensures you get the training that meets your specific requirements. Business Central offers generic, tailored and customised courses in-house. Customised and tailored training allows your organisation flexibility in relation to content, structure and length of each course. 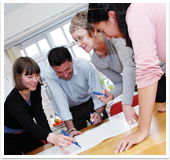 Your organisation's culture can also be integrated into the course to increase effectiveness of learning. This is where we bring one of our off-the-shelf training courses to you. We simply deliver the seminar or course exclusively to your employees at a location and time of your choice. A good option if you have a number of employees who are to attend the same seminar or course. This is where we customise a course to your specific requirements or interests. Customised training can often be a more effective alternative to other training options and has the added advantage of meeting the specific issues and needs of your organisation.